Before digital projectors, before even the film projector, there was the world’s simplest projection tech: light source, shadow. From the traditional Indonesian art of Wayang shadow puppetry to modern artists scrounging used overhead projectors as they are retired from schools, the medium is as rich as ever. Objects cast their hard edges against shifting patterns of colored light. The advantages of organic technology can’t be overstated: the slightest deviation of an object from a surface causes it to sink into soft focus, and even the darkening, irregular edges of the surface are gorgeous. 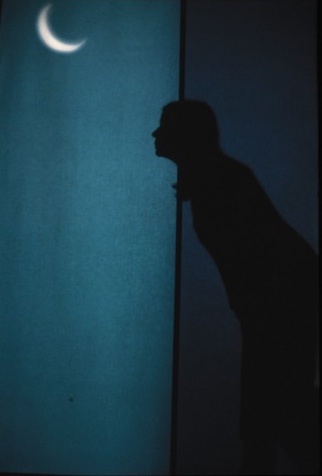 Before digital projection, the use of shadow enabled multimedia immersion with only some electronically-controlled mechanical lights and a lot of creativity. The Portuguese artists Lourdes Castro and Manuel Zimbro have their own body of theatrical spectacles, now visible in a collection on display at Porto, Portugal’s Serralves through June 13. While I was in town last week, the lovely Ines Dias de Carvalho accompanied me to the show. The mechanism of their lighting rig was especially interesting, a relatively simple set of switches and motors that allowed them to shift lights and lighting effects. Today, with cheaper electronics and projects like Arduino, it’s actually surprising that we don’t work with these techniques more – they’re more accessible, easier, and cheaper. Working first with Rene Bertholo, then with Manuel Zimbro, Castro in the 70s created what she called a “Theater of Shadows,” a fantastical juxtaposition of an otherworldly sublime with everyday objects and scenes. Somewhere between Wayang and Dada, the theatrical settings appeared from the documentation to look fantastic, and shadows permeate her other work, from scrawled outlines on sheets to shadow-rendered documentation of her native Portuguese island Madeira’s native botany. Shadows are the source, then, for motion, theater, and still design alike. Work with shadows, as I said, is a vast topic. Have you worked with directly-projected light in your work? Seen shadow art that inspired you? Let us know.